Walkers calls itself “the world’s finest shortbread,” and we can’t much argue with that. 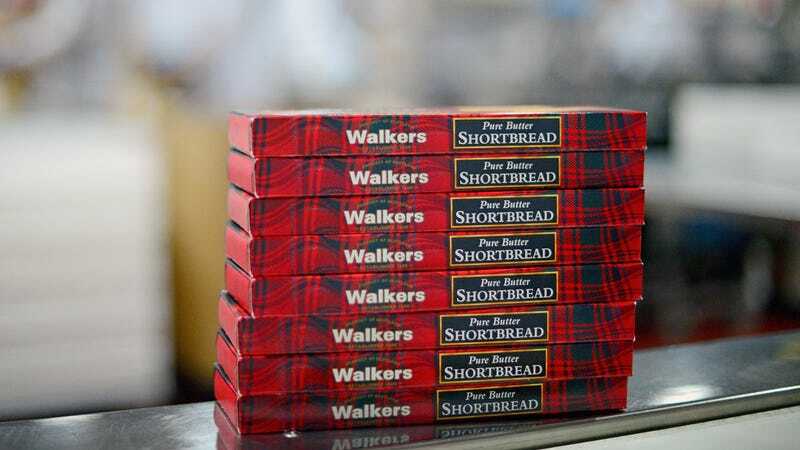 Its buttery, crumbly rectangles and iconic tartan are synonymous with shortbread, and the company exports its simple treats to more than 80 markets worldwide. It is a Scottish national treasure, in the true sense of the word. But Walkers Shortbread is in peril. According to reporting from the U.K.’s Express, the company’s profits fell 60 percent last year, making it one of the company’s worst years since it was founded in 1898. At fault? Butter. He was able to afford only seven new sweater vests this year, and has had to curtail his single-malt consumption significantly. These are dark times. But James Walker tells Express he will not cut corners; he will accept no substitutes for glorious, artery-destroying butter. There will be no vegetable oil. There will be no substitutes. There is only butter. Perhaps there’s some way that U.S. shortbread enthusiasts can help? After all, American dairy farmers have a glut of milk on their hands; could not this be sold to Scottish shortbread manufacturers in need? I implore the best macroeconomists of our generation to solve this crisis posthaste. Or at least before tea time. Ask The Salty Waitress: What to do if the live band ruined dinner? How do food TV hosts eat gracefully on camera?